One of the many things I do on my groundhog days is make baby food. I’ve been making a ton of it lately. Building a stockpile of assorted foods. Perhaps if I only had one baby I’d just by the jarred stuff. But two babies, that’s half my kids! Much healthier and cheaper to make the stuff at home. I usually do it when I’m prepping dinner. And I usually prep dinner in the morning while the older kids are at school. Friday morning I made a Butternut Squash soup. 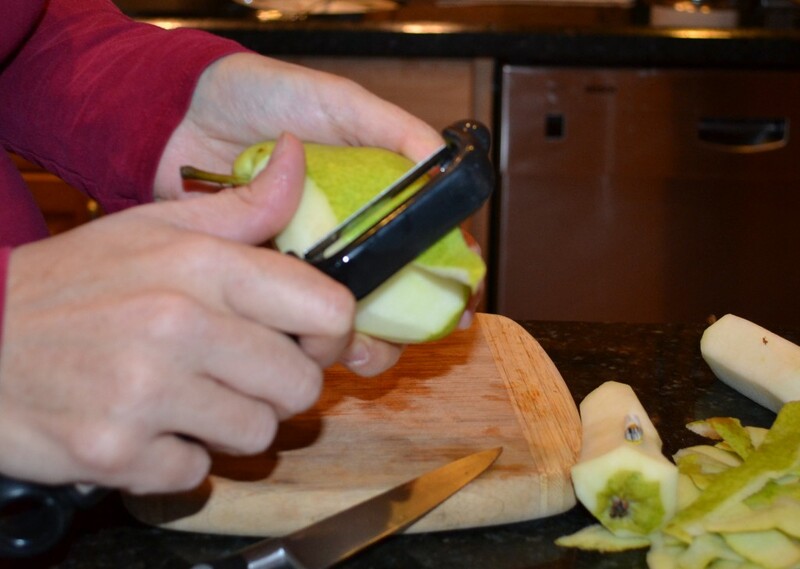 At the same time I made pears into baby food. As you know, loyal readers, I never do just one thing at a time anymore. Anyone out there interested in the process? Next steam them until tender. 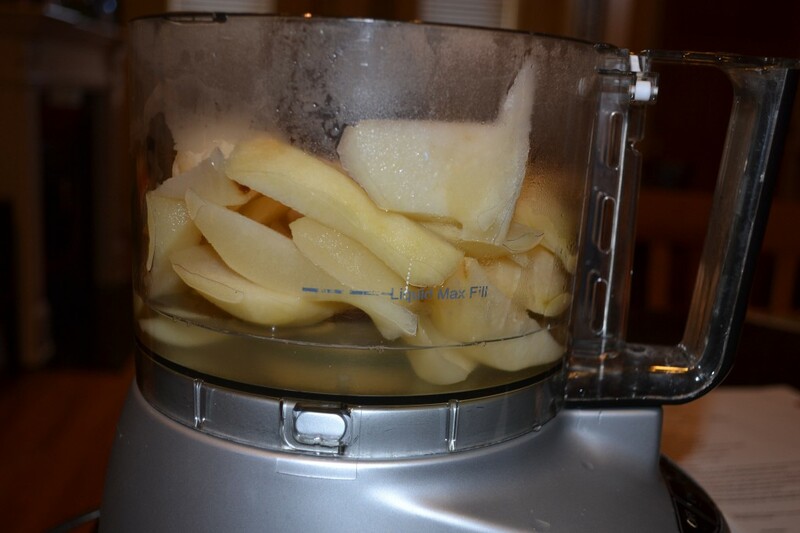 I steamed the pears for about 20 minutes. A fork slid through them easily. If not, I would have just upped the steam time. 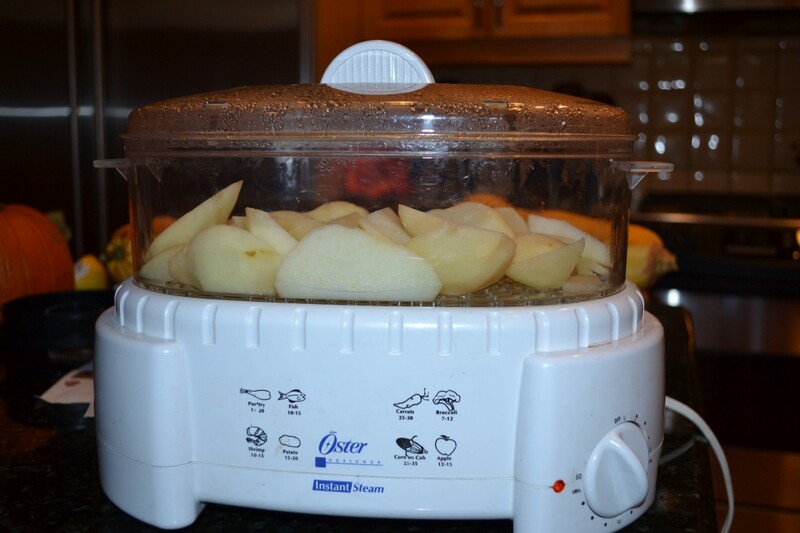 After they are good and tender, I put them in a food processor or blender along with the water in the catch tray of the steamer. I’ve heard it has nutrients still in it. 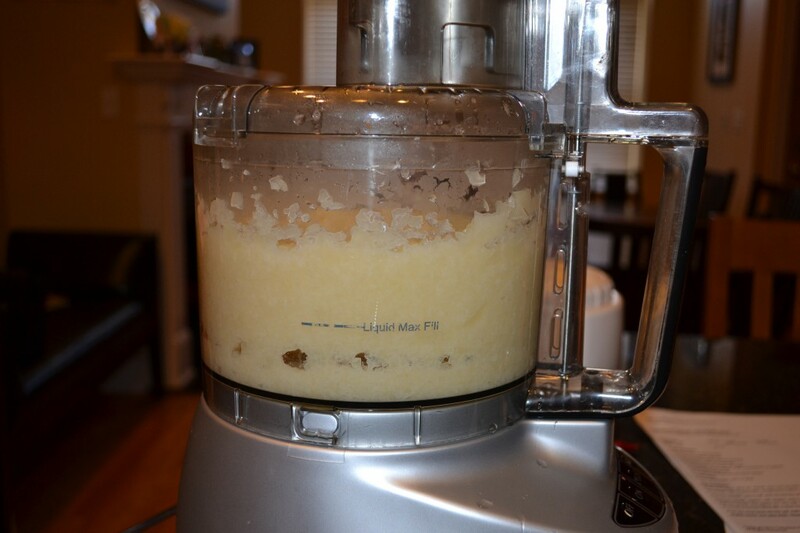 If there isn’t enough liquid you can add water, breast milk, or formula. 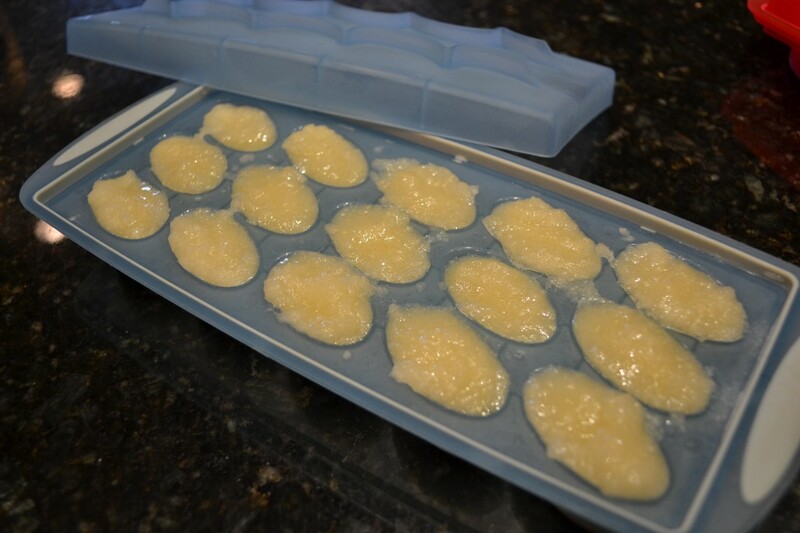 Then I put pour it into ice cube trays and freeze them. 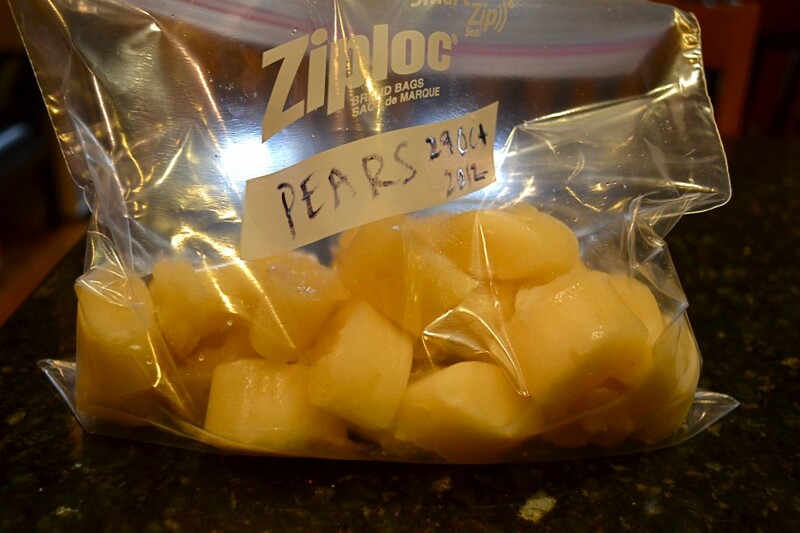 After they are frozen I pop them out and put them in a labelled bag with the date on it. When you are ready to use, just microwave them for a few seconds until warm, stir and feed! 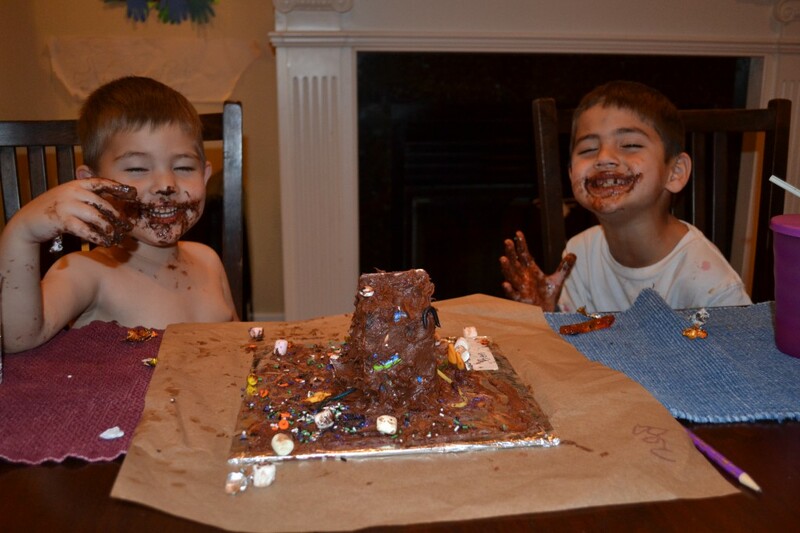 When the twins get older I will do this with whatever we eat. In fact, on Friday morning we had some left over beef stew that I whizzed into baby food for next month. 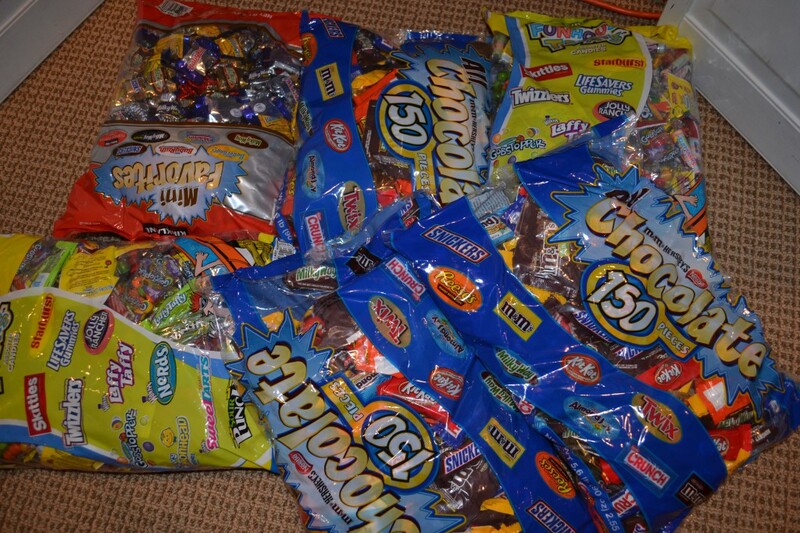 This weekend and next week is basically an exercise in candy shuffling. Adam took a trip to Costco yesterday and bought NINE Costco size bags of candy. That’s 45 pounds of candy! To give Jack some perspective on this, I explained to him that when I weighted him yesterday, he weighted 48 pounds, or nine and a half bags of candy. Six of the Nine Bags we bought. 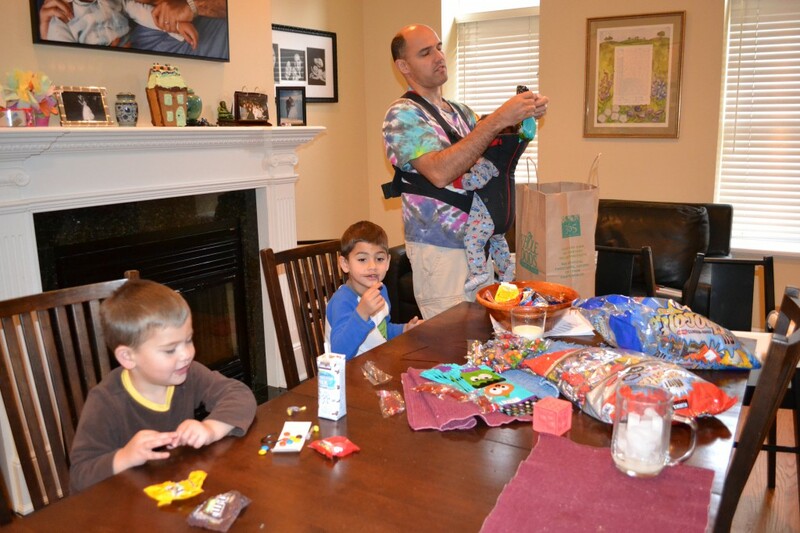 This morning we stuffed bags of candy for both Jack and Ben to give out at school on Halloween. I think Adam is the only one stuffing bags, everyone else is just stuffing their faces! 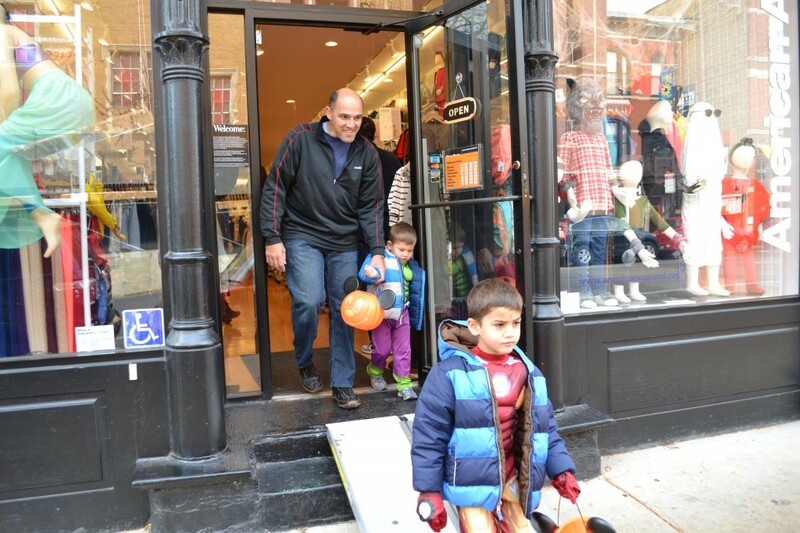 And this afternoon we trick or treated at the shops in our neighborhood, where we got back more candy. 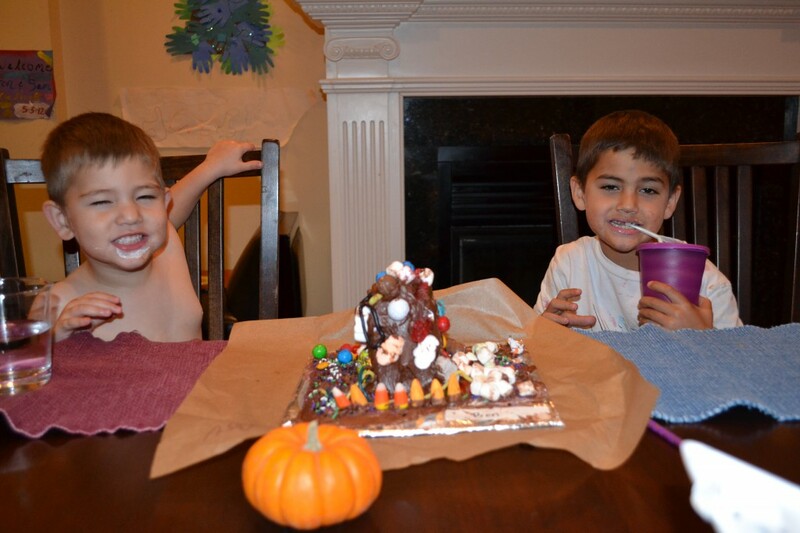 On Wednesday Jack and Ben will bring more candy home from school. That evening we’ll give out huge amounts of candy to trick or treaters, only to have our own kids come back with bagfuls of their own candy. I’m not sure if we buy more candy than we give out or vice versa. And I’m not sure what the winning side of that equation is either. All I know for sure is that my new diet starts November 1st. Anjelica actually found it. It’s been there a couple of days, but it’s taken me that long to get around to photographing it. 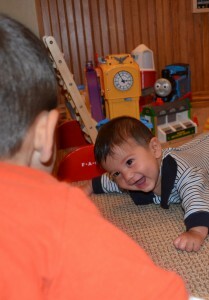 The best thing about this blog is that, since I’ve started it, I have no guilt about baby books or photo albums. It’s all here, plus a diary of stuff that happened to the kids before they were old enough to have memories for themselves. Jack made these when he was in pre-k too, but when he brought them home he never ate them. He preferred to display them on the mantle until they were rotting and needed to be thrown out. But all kids are different. Ben is not a saver. If Jack gets a new sticker book, chances are he will not use the stickers because he wants to preserve them in their perfect form. Ben will rip them open and start tearing them apart right away. And so it was with the Haunted Gingerbread House. He was even kind enough to share it with his brother. 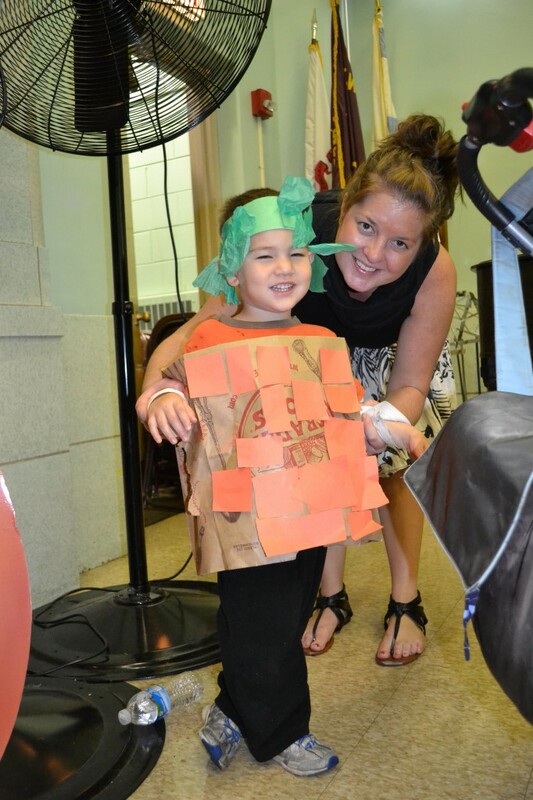 Today Ben had a couple of halloween activities at school that I was lucky enough to enjoy with him. 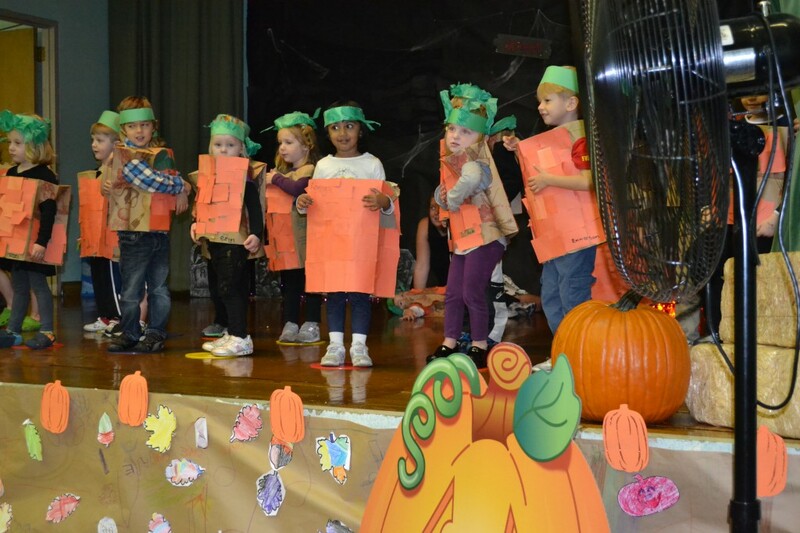 Afterwards they treated us to a Halloween performance. Can you spot Ben? If you haven’t seen him yet, perhaps you are setting your sights (and your standards!) too high. Look lower, and further back. He’s laying on the floor behind all the other performers. Every other kid is standing nicely on the dot that the drama teacher laid out. Then we both had a giggle. I know what you are thinking, where do I find the time to read with four small kids around? The answer? While breastfeeding. My mother in law bought me a Nook reader and it stays right next to my boppy. You’d be surprised how many minutes you breast feed twins during the day, each time I read a few pages. My favorite genre these days is foreignness. If it’s true foreignness it’s even better. Perhaps it’s because travel has always been a thrill for me. I love nothing more than to submerse myself into another culture completely. With four kids, that’s not happening anytime soon. If you are in the same boat as me, then please take your pick from the list below. You too can take a vicarious travel around the world. Some I read years ago, some just recently. Anyway, I’m currently looking for more good reads. Doesn’t have to be foreign. Just enthralling. A few minutes ago I finished Gone Girl, another book recommended to me by my friend Lottie. A psychological thriller that was totally addicting. I ate it like it was a batch of fresh baked brownies, it took me less than a week to complete. Suggestions anyone? Life during the week has become somewhat predictable. It’s not that we do the same exact thing every day, but a pattern has emerged. After the morning rush of packing lunches, making breakfast, getting dressed, Adam drops both boys at school in the morning. Ben first, then Jack. I stay at home and juggle twins. If I’m lucky they both take their first nap at the same time and I can catch up on sleep. A good night here happens if I only get woken 3 times at night. But there are still plenty of nights I’m woken up 6 or 7 times. Those are the nights I run from the twins room to Ben’s room. Some days they both want to be held at the same time. Every day includes one or two load of laundry, wash, dry, fold and put away. Every day involves emptying the dish washer and filling it up again. I prep dinner, I make baby food. 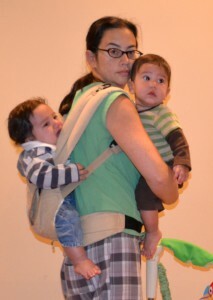 I run errands, twins in tow. Anjelica arrives in time for me to go pick up the older kids from school. 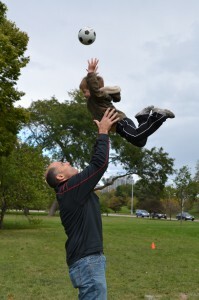 Sometimes we get a quick play in the park. Then we come home for homework, dinner, dessert, baths, books and bed. Angelica does the baths and evening feeds for the babies while I push the older kids along, sometimes getting a shower in while they are bathing. My life has become groundhog day. I don’t know what it is about my friend Jennifer’s birthday. Perhaps it’s the time of year that makes us all a bit silly. Last year this time we found ourselves in a karaoke bar at 2am, singing badly to a drunk crowd. This year we celebrated Jennifer’s birthday at Sofra Turkish Kitchen. Turkish and Mediterranean food, BYOB and Belly dancing. It was definitely one of our more unusual mom’s night outs. The place was not that packed, but oddly enough it seemed that everyone there was celebrating something special. Pam printed out a restuarant.com voucher, buy $100 worth of food and get $50 off. That combined with the BYOB left our bill at a mere $12 a person. Much cheaper than our normal $60 a head nights out. I could get used to BYOB dining! Especially since I love ethnic food so much, and most BYOBs tend to be that way. After dinner we lounged in the comfy pillows that surrounded out table until I was almost vertical. I realized I ought to find my bed before I fell asleep in the restaurant. I was up by 4am for the day and it was showing. 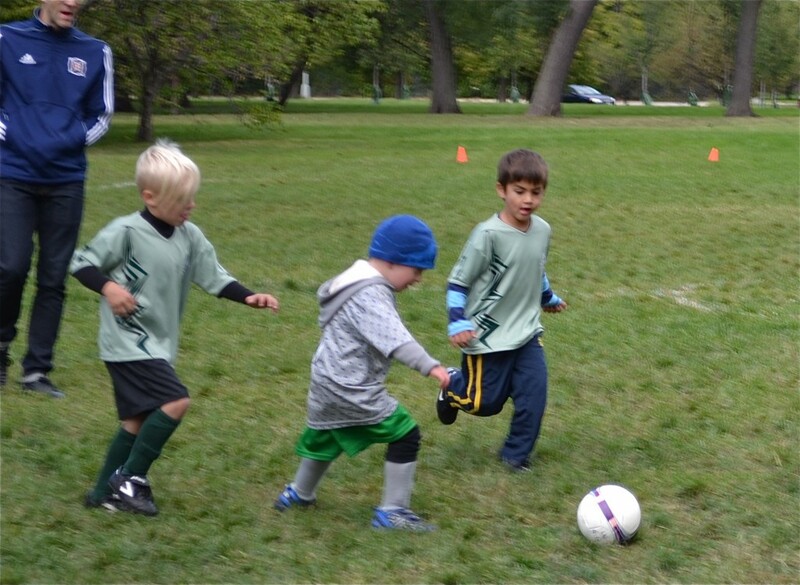 After seeing how much Jack enjoyed Lil Kickers, we decided to sign him up for the big leagues – AYSO. Lil kickers starts as early as 18 months and runs up to age nine, AYSO’s youngest members are 4, it’s oldest are in high school. At Jack’s age group they have teams of 5 guys, but only 3 play at a time during the game. The field is smaller than a normal size and so are the goals, the time per quarter and soccer balls. But other than shortening everything, it’s a real game. With real scoring, real uniforms, real coaches on the other side screaming and acting insane sometimes. Parents show up with other kids in tow, carrying their spectator foldable chairs and their team cheer. Jack is proving himself to be quite a defender. I love to see him get in there and pull the ball away from the other guys. He’s totally engaged, and fearless. He runs after the ball the entire time he’s in the game, never tiring. And somehow, innately he seems to have picked up the code of sports conduct. 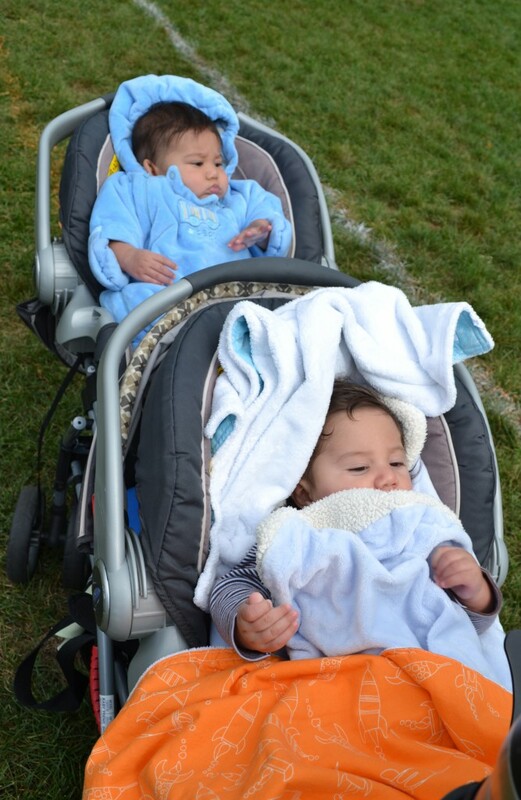 If someone asked me if I would be willing to wake up once or twice a night to feed the twins in order to keep them this age forever, I might actually take them up on it. I’m so in love with this age. They are happy to see me, but they are also happy to see just about anyone else as well. 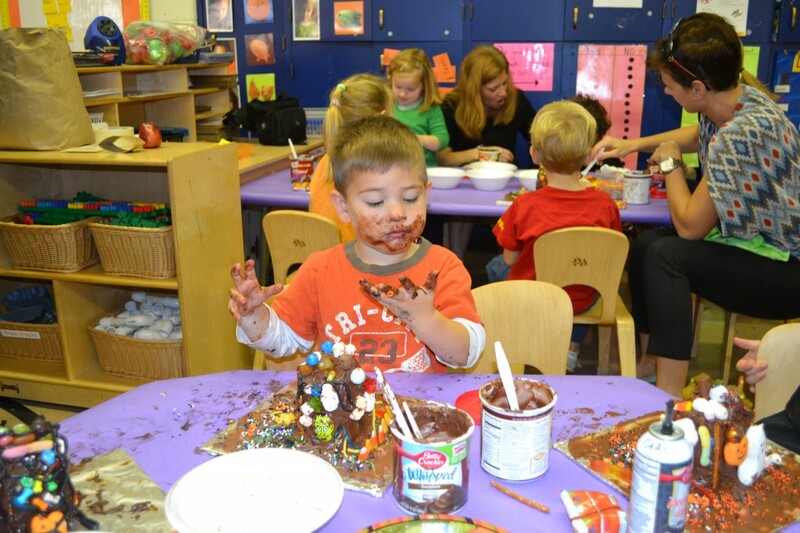 They move around, but not so much as to create huge messes everywhere they go. They mostly just breast feed, which makes planning meals a snap. Sadly, much as I’d love them to stay like this forever, I can see their developments daily. 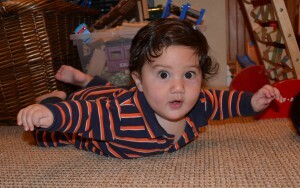 Initially I thought Aaron would be the first to crawl, but now I’m changing my bet to Sam. Aaron was the first to move around, pushing himself forward with his back legs while shoving his face forward into the carpet, arms dragging on his side. Sam, on the other hand, looked like he would never move. His meaty frame seemed to immobilize him. Instead he would stay put and practice his ‘superman pose’ over and over again. However, I’m starting to see how his repetition is paying off. Superman is now super strong and starting to push himself up on his hands and knees and rock back and forth. Aaron is still tossing and turning easily from front to back, but he seems more interested in practicing his flirting skills instead. He’ll lay on the floor, all snuggled up like a cat in a spot of sunlight, sucking his fingers and watching, waiting for you to make eye contact. Then boom! Huge smile! It’s no surprise that Sam, after six days of trying, has figured out eating and it’s making up for lost time. 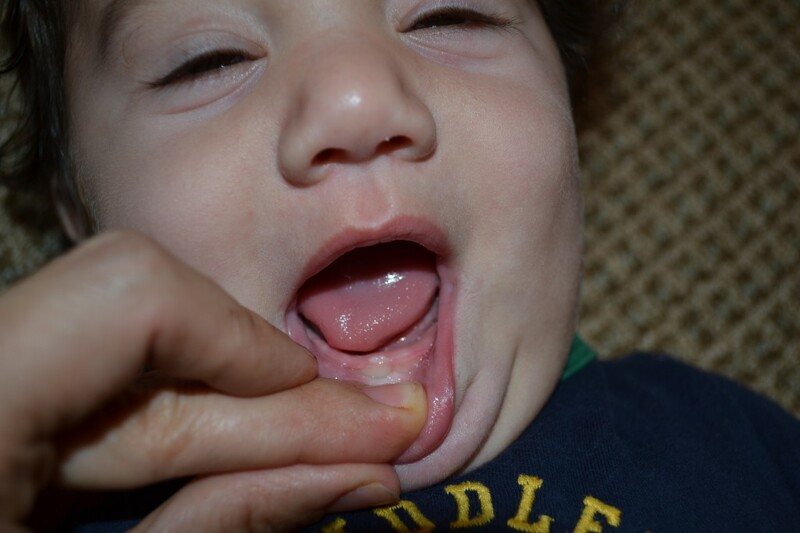 Angelica fed him three cubes of peaches Tuesday night, and more on Wednesday night. Here come the stinky diapers! Aaron is still grossed out by the entire exchange. I wonder how many days he can make faces at my home made baby food before he finds something he likes. 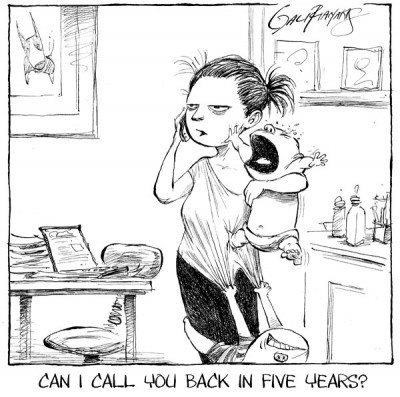 If my older kids are any indication, perhaps five years? Or longer? One of the things that Aaron has managed to master faster than Sam is sleeping. Most nights he sleeps until 5am. And sometimes he’ll sleep a longer nap. They both don’t have a consistent nap schedule yet. I just follow the rule that, when they wake up, they will be tired 2 or 3 hours later. If they sleep 45 minutes or 2 hours I just note it and watch for signs of tiredness again 2 or 3 hours after waking. Sometimes they have 2 naps, sometimes 3. If I’m lucky they over lap and, not matter how much housekeeping is piling up, I force myself to jump into bed and try to sleep.